Sand Under My Feet: Dresslily Black Friday and Cyber Monday Sales! Whew! Somany sales and promotions happening this Black Friday and Cyber Monday! And of course our well loved online shops are also jumping on the bandwagon! One of my fave online shops: Dresslily is sparing no effort to offering its customers the biggest sale and discount of the year. 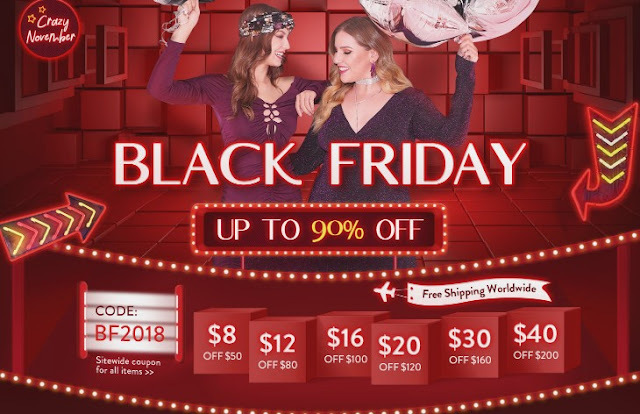 The BIGGEST sale of the year on https://www.dresslily.com. Get 26% off using code "BFCM26" (Site-wide)! Participate in thelucky draw after using code "BFCM26" for a chance to win an iPhone XS, a XIAOMI robot cleaner and more! Expires on Nov. 30th.